A few days ago, a few friends from high school got together for lunch on the spur of the moment. We chose to go to lunch at a place that has been receiving quite a bit of buzz both around town and has received national attention, too. 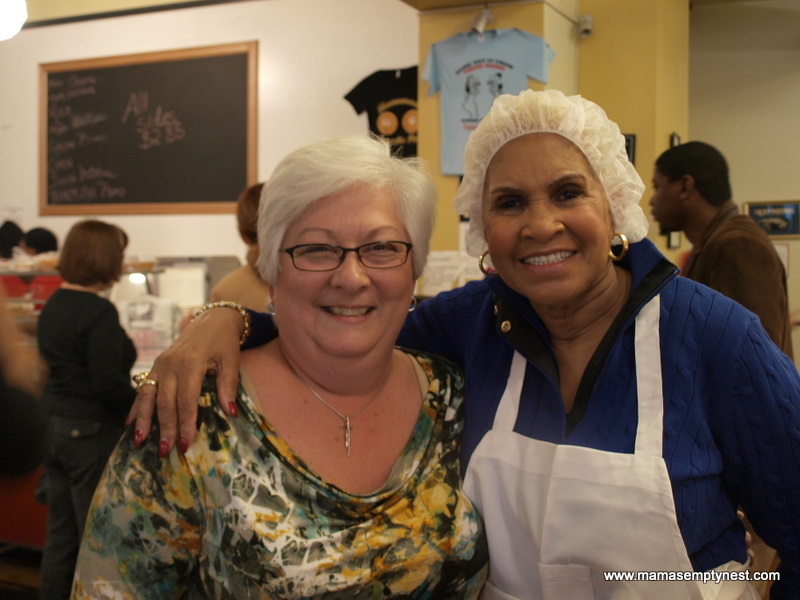 The place – Sweetie Pie’s at the Mangrove – is a soul food restaurant located in The Grove neighborhood in the city of St. Louis. It is owned by Miss Robbie Montgomery who learned to cook in her mother’s kitchen, but started out life as an entertainer including stints as an Ikette (backup singer to Ike and Tina Turner). She also toured with Dr. John as a “Night Tripper” and worked with Stevie Wonder, Barbara Streisand, Joe Cocker and the Rolling Stones among others. Miss Robbie honed her cooking skills while on the road as an entertainer. Back in those days, they could not eat in many restaurants due to segregation so she prepared meals in their hotel rooms on hot plates. After she retired, she opened her first restaurant in California, but eventually made her way back to St. Louis. We are glad she did! The sign at Sweetie Pie’s. The day we chose to go to Sweetie Pie’s, in turns out, they were filming for her new show on The Oprah Winfrey Network (OWN) – Welcome to Sweetie Pie’s. We actually were filmed and asked to sign releases allowing our images to be used in an upcoming episode. Wow, we didn’t know we were going to become celebrities! 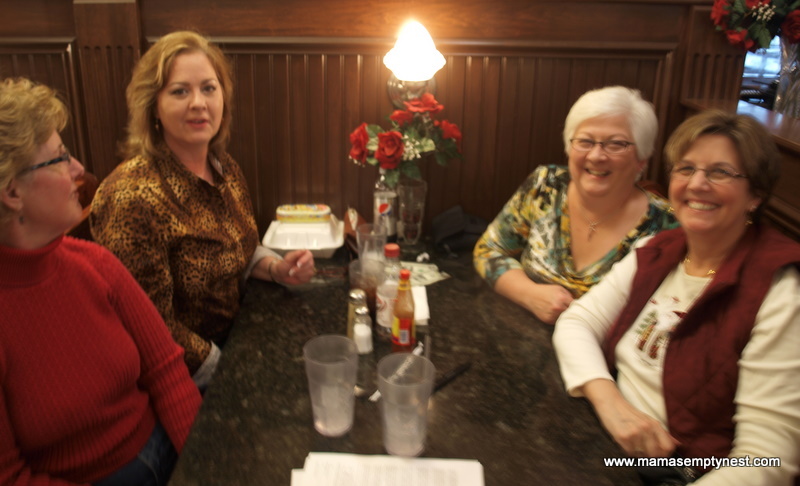 Lunch with high school friends (Teri, Kim, Mama, and Martha) at Sweetie Pie’s. When you go to Sweetie Pie’s, you will go through a buffet line and pick your choices of entrees and side dishes. Several entrees and sides appear everyday and many more appear on a rotating schedule. Your beverage choices are soda, water, or tea. The lines are long, but it doesn’t take too long to get through them and to a table where a server will take care of anything else you might need. Our server was a young man named Dee who spied some Chex Christmas Mix that one of our friends had prepared for us for the holidays. We had shared an extra bag with Miss Robbie, and word quickly spread. He spent the rest of our lunch begging for samples, and one of the other servers came by for samples, too. It was great fun! And, in spite of the camera crews, and the busy lunch crowds, Miss Robbie made it a point to visit with many of the customers. I had been trying to snag a picture of her, and she noticed, and she made an extra effort to come by and take a picture with me. Yes, I am a food groupie. I love getting pictures with my favorite restauranteurs and cookbook authors. Thanks, Miss Robbie, for good soul food, and a great lunch experience! And thanks to my friends of over 40 years who shared a fun few hours with me for the holidays! Martha needs to share the recipe for her Holiday Chex Mix. I had it for dinner that night! Fun was had by all!! If she shares it, I will blog about it. I swapped recipes with the women in the checkout line at the grocery store today and got an interesting one for “Crock Pot Candy” that sounds easy. They gave me a piece and it was yummy! Miss Robbie need to do a cookbook, next – Theresa and I will be first in line for it! Where were you?! Yes, I would buy that cookbook – I love Southern cooking and soul food. Ok, so I went back to Sweeetie Pies today to bring them some of the White Choc party mix. I took them the recipe also. Dee saw me right when I walked in and got all excited. He was pouting though because I had him take me to Miss Robbie. He wanted it all. She was eating lunch and talking to two other gentleman. (By the way, they were filming again today). Anyway, she was so happy to get the party mix and the recipe. I asked her where she wanted me to put it so she could eat her lunch. She said she was going to keep it in her lap and save it for their Christmas party. The camera’s were filming me the whole time. They followed me to her table. Yikes! I hope you don’t mind Theresa; I printed out a copy of this blog and game it to Miss Robbie. She said that was so nice. Just may end up on the special. Now to find out when it will be airing. Dee was still pouting when I left. funny man. That is so great! She sounds like everyone’s Mama at Sweetie PIe’s! We’ll have to keep an eye out for the shows when they come out! veryone into her place like she’s your best friend. Yes, she is 70 and looks fabulous! She has the most wonderful complexion. She was very nice.